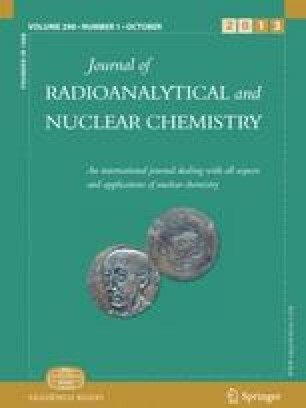 A montmorillonite–iron oxide composite (MIOC) was prepared to assess its effectiveness in the removal of Cs+ and Sr2+ from aqueous solution. A comparative and competitive adsorption study was conducted in single and binary systems. Used materials have been characterized by X-ray diffraction (XRD) and Infrared spectroscopy. Adsorption of Cs+ and Sr2+ as a function of contact time and pH was investigated, adsorption data of single metal solutions were well fitted to the Freundlich–Langmuir isotherm models. Equilibrium isotherms for the binary removal of Cs+ and Sr2+ by MIOC have been analyzed by using non modified and extended Langmuir models with a satisfactory R 2 values. Neutral solution pH was found to be favorable for both single and binary systems. The adsorption model analysis revealed that MIOC was more selective for Sr than Cs. The maximum adsorption capacities for individual Cs+ and Sr2+ solutions were 52.6 and 55.5 mg g−1, respectively. While the maximum uptakes in the binary system were 41.6 and 47.6 mg g−1 for Cs+ and Sr2+, respectively. Column adsorption experiments were carried out at room temperature under the effect of various operating parameters such as bed depth, initial cation concentration and flow rate, Breakthrough curves were well fitted to the Thomas model. Desorption experiments were also conducted to assess the possibility for the reuse of adsorbent and the recovery of cations. This work was supported by the Algerian Atomic Energy Commission. The authors are grateful for the financial support.